Yesterday was the 47th anniversary of the premier of TOS's "City on the Edge of Forever." This classic episode is one of my favorites so I queued it up on Netflix this morning and let it run in the background while I was working. 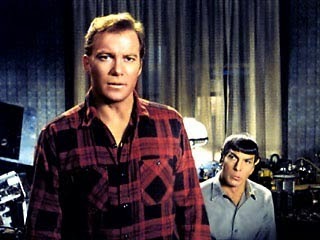 Again, I was surprised by how wonderfully Kirk and Spock work together. How much I like Edith Keeler. How punchy the dialogue is. And, how they managed to find such a stellar (and what would become legendary) episode in the very first season of the show. Put this man on a paper towel commercial STAT! Anyway, the other stuff I've been doing this morning: scheduling blog tours and readings for my newly released novel, Awesome Jones, making breakfast, figuring out how long I can put off a trip to the grocery store... all that stuff just takes up my time. In My Year of Star Trek, do you want to know how much writing I did outside of the blog? Almost none. I wrote a couple articles for The Mary Sue and toward the end of the year I wrote a very short story that was published on Monkey Bicycle a few weeks ago. But, otherwise, I didn't have time to write. I was doing this project. I don't regret it at all. MYOST made me a better writer, a better reader, a more conscientious television viewer, a different kind of fan, and, in the end, a better person. But, (almost) every day, I watched several episodes of Star Trek and (almost) every day I wrote a post and that became my writing life. Now, suddenly, it's April. I'm writing about every week or so and I keep trying to tell myself that this isn't the new normal. I miss this project but I keep not writing. Every time I show up here I apologize for not writing. It's a silly thing to do. It's my project and I ought to just write whenever I feel like it. But, it's hard to accept. I keep hoping that I'll find some way to even it out. Work on my fiction five days a week. Blog two. Is this realistic? As I was watching City on the Edge of Forever, I realized that, like Kirk, I'd managed to slip away from the rest of the world, the rest of life and all the stuff that comes with it, for a long period of time. Like Kirk, I still had to pay bills and deal with every day stuff but my day-to-day activities were spent in the service of a very specific task. Over time, I fell in love with the project. In January, I mourned its passing. And then I returned to a life more risky and uncertain. My book was released and now I'm writing the next one. Reviews are being sought; tours and readings are being scheduled. My work is no longer freely and daily given to the small, loving community that I've cultivated here but to anyone with an Amazon account and three bucks. Does Kirk think about Edith Keeler in season two or season three while navigating uncharted space? Does he consider going back to The Guardian and trying to find her again? Trying to apologize for not being there? Trying to devise a way to stay in both 1930 and 2270? I don't know. But, I bet he does. In the end, though, Kirk can't have both. He goes back to life on the Enterprise and never mentions his time spent buying groceries and sweeping floors and taking his girlfriend to the movies. He never sees Edith Keeler again and, for all intents and purposes, that time in his life is swept aside and no longer mentioned. But I don't have to do that. My Year Of Star Trek will go on--if sporadically. And I'll stop apologizing and stop talking about apologizing and, eventually, I'll find a balance.